Notice that Scott “Still hasn’t quite gotten” Rolen–he of the .179 OBP–has been replaced in the clean-up spot tonight. Instead, playing the role of Joey-Votto-shield will be…Brandon Phillips? He of the .231 OBP and ouchie hamstring? That’s sure to put the fear into ’em. 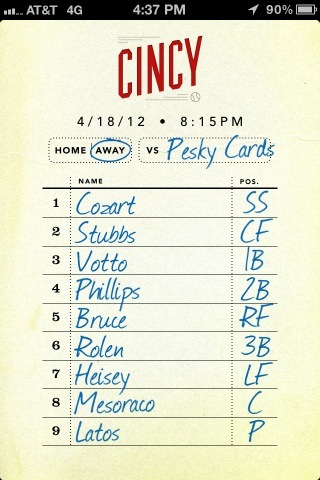 Replacing Phillips in the lead-off spot is Zack Cozart, which is a move I can entirely get behind. Baker can occasionally *do* sensible things; he just can’t ever *say* them. Hopefully the stress doesn’t get to young Cozart. It can be a lot of pressure to be the first guy left on base. Mat Latos takes the mound for the Reds tonight, looking to bring down that 5.59 ERA. While that number certainly belies the skill of Mat Latos (but not the skill of Matt Belisle), it occurs to me that at this point in the season it’s pretty impressive that it’s almost the highest ERA that the Reds’ pitchers have. Ah, I remember those gaudy Eric Milton days, back when triple digit ERAs to start the season would only cost you a nickel. Nowadays, pitchers can’t even afford both Ts for their names. It’s a crying shame, I tell you! Can you tell I’ve just woken up from a nap? The verbal meandering is getting entirely out of hand. And so is the Cardinals’ early season hot streak. Let’s see what our Cincinnati boys can do about that tonight. A young lady’s conversation with Eric Young, Jr.
Who was your favorite team growing up? And other than your father, who where some of the players that you looked up to as a kid? Favorite team growing up was whichever team my dad was on. I was a big Ken Griffey Jr fan growing up. When you are up to bat what is your theme song? I’m going with Drake “Headlines” this season, and maybe the Bernie. Still debating on that one. Do you have a favorite restaurant in Colorado? And what is your favorite food? Name 5 songs in your Ipod right now that you have on repeat? Do you have any rituals or superstitions before and during a game? Can you give me an example? I try to eat healthy before a game, usually oatmeal. Music headphones on a bunch. Try to get enough rest before getting back to training, and visit my family members. Refuse 2 Be Ignored is one of your slogans can explain what it means to you. It means embrace all/any of your talents. Refuse to ignore what your good at/makes you special to the world in your own right. I just love to encourage people to find what their gift is to the world. You and your father hold a historical moment with the Rockies organization; can you tell use about it? We have a few. His opening homerun in Denver, my debut in ’09, our playing against each other in spring training. It’s all been a blessing to our family. At the 2012 Winter Meetings your name came up in several trade possibilities including the Mets, Tigers and Mariners, if you could play for any team who would it be? I just want to play and utilize my abilities to my max potential. It doesn’t matter where. What trade or free agent player signing will have the biggest effect on their teams chances of making it to World Series? You never know before the season starts. You have to see how the teams gel together when they get new personalities to a team. Four of the fastest men currently in MLB – EYjr, Brett Gardner, Michael Bourn and Carl Crawford who is the fastest? You always have to believe in yourself, so I’m saying me. All those names can fly though. I enjoy watching all those other names play the game of baseball. If you were not playing baseball, what else could you see yourself doing? I can see myself as a barber. Any reason for number 1? Number 1 was my original number when I was 7 years old. Do you have any other nicknames than Base Burner or EY2? What was the difference playing winter ball in Hawaii and Venezuela? Hawaii is a state and Venezuela is another country. The difference in cultures is the biggest difference. What advice would you give to the young readers? Find what you’re special at and embrace it. I love to play ball and cut hair…so I’m giving it all I have.